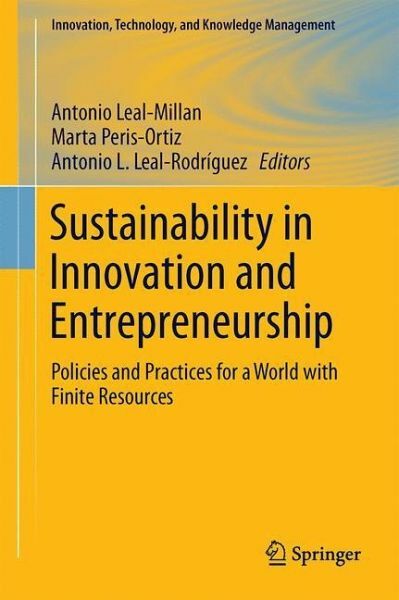 Herausgegeben von Leal-Millan, Antonio; Peris-Ortiz, Marta; Leal-Rodríguez, Antonio L.
This book provides a richly illustrated study of sustainability, innovation and entrepreneurship. Specifically, it examines the ways in which governmental policies and practices modify the social conditions necessary to promote innovation in businesses and by so doing impact economic development. Exploring topics such as green innovation, green customer capital, smart cities, green entrepreneurship and environmental responsibility, this book presents some of the most current research and best practices in the field. In today's global economy, strategies, policies and practices that address the negative effects of human activity on the environment need to be incorporated into the business framework in order for companies to achieve a sustainable competitive advantage. Around the world, such changes have already resulted in a broad range of products, production methods and technical features that ensure environmental protection. At the same time, the mass media's communication of a deteriorating earth have motivated a growing number of citizens in both developed and developing nations to modify their consumption habits towards more ecological products. Consequently, an increasing number of companies are reacting to these changes in business and legal frameworks and consumer preferences by investing in new forms of green innovation or "eco-innovation" designed to promote both environmental and corporate sustainability. For example, Hewlett-Packard eliminated lead from its welding process; Wal-Mart reduced the emissions of their suppliers; and Cisco, Dell and IBM are investing in smart grids. This volume showcases pioneering efforts among companies, citizens, and government agencies that are moving from theory to practice by placing sustainability at the core of their development strategies. Antonio Leal-Millán is a full professor in the Faculty of Economics & Business and the Head of the Department of Business Administration & Marketing, Universidad de Sevilla (Spain). He has made numerous stays as visiting professor at the Leicester University, London Metropolitan University, Nottingham Polytechnic University and Aston University of Birmingham (UK); University of Arnhem and Technical University of Nijmegen (The Netherlands); University of Paris IV - The Sorbonne (France); Lisbon University, University of Faro, University of Evora and Modern University of Lisbon (Portugal); Catholic University of Buenos Aires (Argentina); Autonomous University of the South, Austral University, Catholic University of Santiago (Chile); Federal University of Sao Paulo, Private University of Curitiba, Catholic University of Salvador de Bahia, Getulio Vargas Foundation of Rio de Janeiro (Brazil); Continental University of Lima (Peru); Universities of Pinar del Río and Havana (Cuba); UPB (Bolivia); UNAM (Autonomous University of Mexico), etc. He has conducted twenty doctoral theses and his research interests focus on the social change related to organizational behavior, organizational culture, knowledge management and innovation technology. His work has been published in a variety of leading journals including British Management Journal, Journal of Knowledge Management, Journal of Business Research, International Journal of Project Management, International Journal of Environmental Research and Public Health, Management Decision, International Journal of Technology Management, Industrial Marketing Management, Journal of Organizational Change Management, Journal of Occupational and Environmental Medicine, and so on. Marta Peris-Ortiz is Professor at Universitat Politècnica de València (Polytechnic University of Valencia). She received her PhD in Management from the University of Valencia in 2005. She has an MBA in Banking and Insurance Management and she has made numerous stays as visiting professor at prestigious international colleges such as Oulun Seudun Ammattikorkeakoulu University (Finland) Trier University of Applied Sciences (Germany), Ipag Business School (France), CETYS University (Mexico), among others. Her current research is focused on the topics of Entrepreneurship, Corporate Social Responsibility, Sustainability, Innovation, Knowledge Management and Education Innovation. She has published articles in journals such as Journal Business Research, Management Decision, Service Industries Journal, Technological Forecasting and Social Change, Service Business, European Journal of International Management, Journal of International Change Management, International Entrepreneurship and Management Journal, and Non Profit Management and Leadership among others, and is also a reviewer. She has been Guest Editor of Management Decision, European Journal and International Management, Service Industries Journal, Canadian Journal of Administrative Sciences, Technological Forecasting and Social Change, Small Business Economics and Journal of Knowledge Economy among others. She is on the editorial board of several journals of relevant international prestige. She has been President in different International Conferences and she has been executive secretary of the International Network of Business and Management Journals. 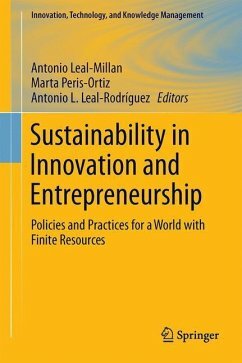 Marta Peris-Ortiz has been Editor of several books published by Springer such as Entrepreneurial Universities; Sustainable Learning in Higher Education; Innovation and Teaching Technologies; Entrepreneurship, Innovation and Economic Crisis; Entrepreneurship, Regional Development and Culture; New Challenges in Entrepreneurship and Finances; Management Innovation; Strategies in E-Business, and Cooperation and Networks In Small Business Strategy; among others. Since 2016, she has been a member of the DEVA agency evaluator group, responsible for evaluating degrees and masters in Andalucía (Spain). Antonio Luis Leal-Rodríguez holds a PhD with international mention in Economic Sciences and Management from Universidad de Sevilla. He is currently Professor of Human Resources and Business Management at the Department of Business Management, Universidad Loyola Andalucía (Spain). He has made several research stays at prestigious international colleges such as the London Metropolitan University (UK), Lancaster University (UK), University of Surrey Business School (UK) and University of Twente (The Netherlands). His research interests include knowledge management, innovation, strategic management, and organisational culture. His work has been published in a variety of leading scientific journals including International Journal of Project Management, International Journal of Quality and Reliability Management, Journal of Knowledge Management, Journal of Business Research, International Journal of Environmental Research and Public Health, Management Decision and The Service Industries Journal, among others. Chapter 1: Policies and Practices for Sustainability in Innovation and Entrepreneurship: An Overview.- Chapter 2: Fostering a relationship learning context as a driver of green innovation performance and green customer capital.- Chapter 3: Smart Cities, innovation and sustainability: which role for cities in Fostering "green" Entrepreneurship?.- Chapter 4: How cultural beliefs and the response to fear appeals shape consumer's purchasing behavior toward sustainable products.- Chapter 5: Sustainable Social Management: The case of Cooperatives.- Chapter 6: Improving Environmental Management Systems by ISO 9001 in the Spanish Hospitality Sector.- Chapter 7: Social entrepreneurship and upgrading in emerging economies: the Indian case of Industree and its brand Mother Earth.- Chapter 8: The relationship between revenue and environmental responsibility: a causal study using reputation in the hotel industry.- Chapter 9: Green Consumer Segmentation: Managerial and environmental implications from the perspective of business strategies and practices.- Chapter 10: How strong might be a carbon tax on electricity consumption to reach Spanish H2020 targets?.